We served champagne and juice boxes, we catered to everyone. This year we will be celebrating St. Patrick’s Day for the first time in our new home. Since I will be approximately a million nine months pregnant, I will be forgoing solo cups of lager for 100 ounces of ice cold water and a bottle of my favorite near beer. I’m not sad about being pregnant for our party this year. Since becoming a mom doing any real drinking (or more accurately, any recovering from real drinking), has become a massive undertaking that involves months of planning and pretty much a week of no responsibilities. Neither of which are easy to come by around here. This year, as I break out the green and white feather boas and the tiny beer bottle confetti, I considered the things that I would be missing out on by having a leprechaun on board. I’ll be trading a regular hangover for a pregnancy hangover. Exchanging indigestion and heart burn for, well, indigestion and heart burn. Okay, so maybe there won’t be very many changes this year. It seems like being pregnant is already a lot like being drunk. Much like someone deep in their cups (you can thank my grandmother for that phrasing), I have to pee about every half hour. There is always somebody telling me that I need to sit down and have a glass of water. It’s 2AM and you want Taco Bell/pizza/wings/French fries? ME TOO! You buy, I’ll drive. I may go all night with energy to spare, or I may pass out sitting up with my glasses still on. It’s anybody’s guess as to which one it will be. Either way, I guarantee that I will wake up the next morning still fully dressed with no memory of having fallen asleep. The person throwing up in the bathroom may or may not be me. There is a pretty good chance that by the end of the night there will be food in my hair, stains on my shirt, and icing on my face. There is also a pretty good chance there will be zero shits given. Eggs, bacon, hot wings, and cupcakes? Yes please! It’s only 11AM? Don’t care! I weeble, I wobble, and occasionally I fall down. Can’t. Stop. Crying. Don’t ask why, it’s not important (and may just cause more tears). Cheap beer makes you gassy? This baby makes me gassy. Four words for you, corn beef and cabbage. I want it, I need it, I have to have it (also at 11AM but whatever). And a shamrock shake. This actually has nothing to do with St. Patrick’s Day, I just really need those things, immediately. 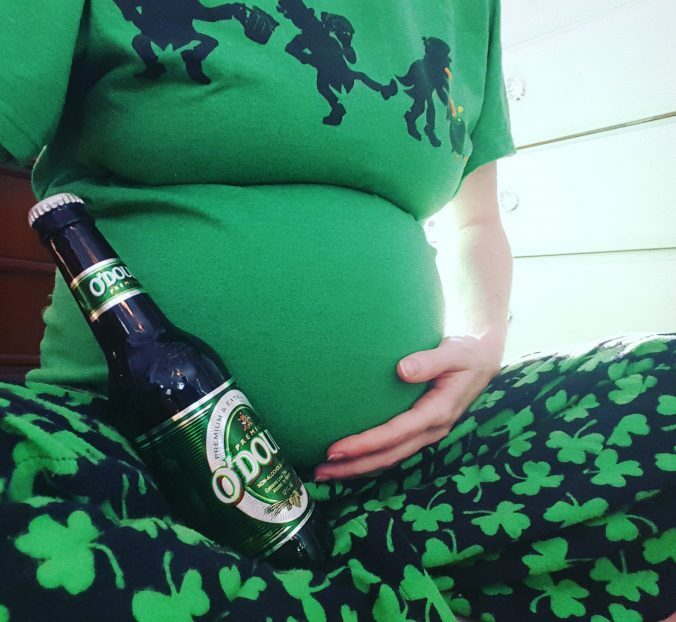 Patrick’s Day will fall approximately four weeks prior to my actual due date. That means that the person who walks up to a large group of people, soaking wet for no known reason, and crying could end up being me. The reasons could range from me not being able to hold it while someone else took too long in the bathroom, or because our daughter decided that she wanted to join in on the festivities a little early. Actually, maybe we should just skip the party this year. I have visions of myself in full blown labor, trying to get a yard full of drunks in green to help me put my husband into the car so that I can get us to the hospital. Although, on the plus side I can totally see the soundtrack to my labor and delivery being sponsored by Drop Kick Murphy’s. I don’t hate that idea. Happy St. Patrick’s Day, however you celebrate (or don’t) this year. There is always next year! Happy St. Patty’s Day! Next year I will have TWO kids to chase after, haha. I think my days of getting white girl wasted in honor of St. Patrick are on hold for now (not that I am complaining, because I can’t recover quite like I used to anyway). Plus now that I know about shamrock shakes, I want for nothing.